we don't believe in two left feet! Dancing is one of the best ways to relieve stress and bring happiness to your life. 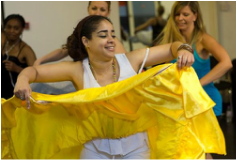 We offer Salsa classes that are full of fun and also great techniques. Learn the moves, from basic beginners, to improvers, intermediates, all the way up to advanced level. Focus is placed on teaching the correct technique for Solo dancing, Partner dancing and Rueda de Casino, with attention to Styling and Freestyle expression at all levels! Classes are held in comfortable surroundings. Whether you want to join us for a single class or pay for a few weeks with a discount. Course duration: ONLY 5 weeks ! ​**There are limited spaces available on this course. Great classes!! I now understand more about salsa and I meet a lot of new people and made friends. ​Salsa is a dance form with origins from the Cuban Son (1920s) and Afro-Cuban dance (specifically Afro-Cuban Rumba). It is commonly associated with the salsa music style, although it may be danced under other types of music with an 8-count rhythm. In Cuban style, the dancers circle around each other, sometimes in 3 points. This circular style is inspired by Cuban Son, specifically to the beat of Son Montuno in the 1920s. However, as it is a popular music, it is open to improvisation and thus it is continuously evolving. ​( THE ORIGINAL WHEEL) –Rueda de Casino – (late 1950s-60s) known as the wheel, it is a dynamic, fun, challenging, creative, friendly competitive, social and inter-disciplinary dance style. Originated in the Havana Casinos’ centre, from where it took the name of Rueda de Casino. A leader (cantante/caller) calls out the movements/combinations, which must be learned. Some figures can be call with different names. This happens also in Cuba; however, some traditional figures should be call the same, such as: dame, enchufla, 70, pa’rriba, pancake, yogur, etc. Many of the moves have hand signs, as well as names, to enable dancing in a loud club setting. The Rueda can be as small as two couples, or as large as a space can hold! 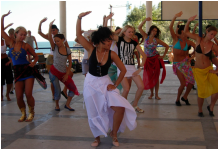 Salsa represents a mix of Latin musical genres, but its primary component is Cuban dance music. The roots of salsa originated in Eastern Cuba (Santiago de Cuba, Guantanamo) from the Cuban Son (about 1920) and Afro-Cuban dance (like Afro-Cuban rumba). The contemporary salsa sound coming out of Cuba is called‚ timba. It’s a fast tempo salsa with a strong afro-cuban influence. Songs will often follow a traditional rumba structure – start slow, break into a core salsa rhythm, then settle into a beautiful call and response vocal pattern. The backing vocalists keep the standard response running while the lead vocalist improvises. Ahi Na Ma!